Gavin Massey is gearing-up for ‘11 Cup finals’ in the wake of Wigan Athletic’s Wembley dreams being dashed last weekend. Southampton ensured they wouldn’t become the fourth top flight victims of Latics’ incredible FA Cup run with a 2-0 win, meaning Paul Cook’s men now have promotion to focus on. A swift return to the Championship was always the main aim of this season, and while they sit in third place, Latics’ fate is in their own hands with games in hand over Shrewsbury and Blackburn. 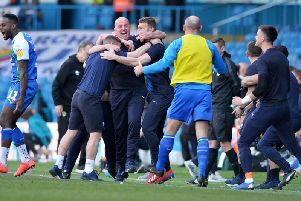 “We said in the dressing room after the game that they’re all cup finals now, and the main aim of the season is still there for us,” said Massey. “We’ve got to put this disappointment behind us as quickly as possible. “The FA Cup was always the bonus for us as far as this season’s concerned. “Obviously we wanted to go as far as we could, and get to Wembley. Latics’ final 11 games are crammed into a 43-day window, and the 25-year-old has warned his team-mates that their League One opponents will be trying to block their path. “We know we’ll be a big scalp for the other teams in League One, but it’s been like that all season to be fair,” said Massey. Massey, though, will still reflect on a Cup run which threw Latics into the limelight with pride. As well as beating three Premier League sides, including champions-elect Manchester City last month, they were the better team for the first half against Southampton last weekend. And Massey agrees his side could look their opponents in the eye. “I think we deserved a lot more from the game...I think everyone could see what a good side we are,” he said. “From minute one we were a different class, but it didn’t seem like anything would drop for us. “It’s been a great cup run, and it’s a shame that it’s now come to an end. Everyone on the pitch – from those who started to those who came off the bench – did a great job, and it’s been like that all through the cup run. Massey also admitted the nature of Southampton’s goals on Sunday was tough to take, especially given Latics had plenty of chances to hit the front. “It’s just a shame we couldn’t extend the run a couple more games, but that’s the way it goes,” he said. “And that’s the way it is when you’re playing against top-quality opposition. “They only need a small window of opportunity and they take it. “They never carved us open, when they did score it was a scrappy goal. “And you can’t help but feel hard done-by.” But Massey insists promotion is just as big a deal to Cook’s players – and he says recent games have proved how much his team-mates are up for the fight.